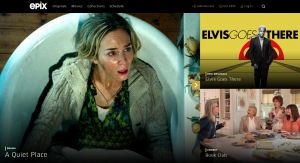 US TV network Epix has launched a new direct-to-consumer streaming service featuring its full library of original programming and movies. Epix Now is available on iOS, Android and Apple TV devices and is due to launch soon on Roku and Amazon Fire TV, with other device launches to follow throughout the year. The over-the-top service is available in the US for US$5.99 per-month and users able to cancel at any time. The rollout widens the company’s distribution strategy. US viewers who receive Epix as part of their pay TV package can already log in with these credentials to access content online and via the Epix app. Epix executive vice-president and general manager, Monty Sarhan, added: “Epix has always been committed to reaching consumers wherever and however they want to watch content. Epix is a premium TV network owned by Metro Goldwyn Mayer. Its slate of new original series includes: Pennyworth which tells the origin story of Batman’s butler, Alfred; Godfather of Harlem starring Forest Whitaker; Perpetual Grace, LTD. featuring Ben Kingsley; and docuseries PUNK from Iggy Pop.